Tony Perkins, Family Research Center: You may not have asked, but I'll tell you any way. Wednesday, Rep. Marty Meehan (D-MA) reintroduced legislation that would not only repeal the military's "Don't Ask, Don't Tell" policy but also the 200-year-old law that bans homosexuals from openly serving in the military. Citing opinion polls, Meehan says the general support for his bill is growing. However, what matters in this case is not what the latest poll says, but what's best for our military and the men and women who serve. The same study that found higher civilian backing for the repeal also showed overwhelming opposition to change among our servicemen. Only 26 percent of soldiers support a move to allow gays to serve openly. With the demands on the Armed Services, Meehan estimates that over 40,000 homosexuals would join the military if the ban is lifted. What he doesn't address are the tens of thousands who would not join or who would leave the service if the legislation is passed. As a veteran of the Marine Corps I can say that the defense of our country should not be sacrificed for the promotion of a political agenda. Tags: CPAC, 2007, Mike Huckabee, presidential candidate To share or post to your site, click on "Post Link". Please mention / link to the ARRA News Service. Thanks! Tags: Arkansas Republican Assembly, conservative, CPAC, presidential candidate, Richard Viguerie To share or post to your site, click on "Post Link". Please mention / link to the ARRA News Service. Thanks! ARRA Editor Opening Comment: Just like the current concern by Arkansans over the need to block a law masquerading as hate crimes legislation, but which is actually intended to push alternative lifestyles into the American mainstream (SB264), we face an assault on the national level. Tags: Arkansas, Barney Frank, hate crimes, homosexual activism, Shelia Jackson, US Congress To share or post to your site, click on "Post Link". Please mention / link to the ARRA News Service. Thanks! A teacher asks - You Want Me to Do What?. "You want me to go into that room with all those kids, correct their disruptive behavior, observe them for signs of abuse, monitor their dress habits, censor their T-shirt messages, and instill in them a love for learning. "You want me to check their backpacks for weapons, wage war on drugs and sexually transmitted diseases, and raise their sense of self esteem and personal pride. "You want me to teach them patriotism and good citizenship, sportsmanship and fair play, and how to register to vote, balance a checkbook, and apply for a job. "You want me to check their heads for lice, recognize signs of antisocial behavior, and make sure that they all pass the state exams. "You want me to provide them with an equal education regardless of their handicaps, and communicate regularly with their parents by letter, telephone, newsletter, and report card. "You want me to do all this with a piece of chalk, a blackboard, a bulletin board, a few books, a big smile, and a starting salary that qualifies me for food stamps. The Arkansas State Senate and House have passed Republican Keven Anderson's House Bill 1443 which was co-authored by numerous representatives and senators. The Bill would provide income tax relief for taxpayers with income below the Federal poverty level and provide tax relief for other low income families who are residents of Arkansas. It extends tax relief via a tax credit to single tax filers with a taxable income of less than $13,500. Married couples filing jointly would be eligible for the credit if they make less than $21,400. A married couple filing jointly who have two or more dependents get the credit if they make less than $26,700. A single head of household with one or more dependents would qualify if he or she makes less than $19,000. The amount of the credit varies from $416 to $1, depending on the number of dependents and income level. The bill also includes a formula for calculating the credit in future years. The bill has been transmitted to the Governor who has already agreed to sign the bill as part of a negotiated tax package. Thomas Sowell: It is understandable that liberal Democratic presidents, beginning with Franklin D. Roosevelt, loaded the Supreme Court with liberal, Democratic justices. What is far harder to understand is how a whole succession of conservative Republican presidents -- Nixon, Ford, Reagan, and Bush 41 -- managed to appoint so many liberals to the Supreme Court. All these presidents ran on the idea that what courts in general, and the Supreme Court in particular, needed were judges who followed the law instead of making up their own new laws. Tags: Democrat, federal judges, judicial appointments, Republican, Supreme Court Judges To share or post to your site, click on "Post Link". Please mention / link to the ARRA News Service. Thanks! by Rep.s Rick Green (Dist. 66) & Jon Woods (Dist. 98) (3/1/07): The Arkansas Republican Caucus is focusing on protecting your job and protecting your vote. HB1024 prohibits state agencies from contracting with businesses that employ illegal immigrants. We believe that our state government needs to set an example for other businesses across Arkansas. This legislation passed overwhelmingly and was signed into law yesterday as Act 157. Another bill that your Republican Caucus supports is HB 2120 which requires a voter to present a government issued photo identification card before receiving a ballot. Voters who can’t show identification will vote by provisional ballot and have six days to show proof of identity. Our goal is to make sure every registered voter gets a vote, but only one vote. Our right to vote is diminished and diluted by voter fraud and this legislation will help stifle fraudulent balloting. Take Action: Contact your State Representatives & Senators to support this bill. Tags: Arkansas, Arkansas Republican Caucus To share or post to your site, click on "Post Link". Please mention / link to the ARRA News Service. Thanks! KTLO News: The state legislature continues to wrestle with trying to come up with a legal mechanism that would allow for the funding of local projects from the General Improvement Fund and State Senator Shawn Womack (R-Mountain Home), co-chairman of the Joint Budget Comm., finds himself in the middle of a major controversy. Also in the Senate, is a bill sponsored by Sen. Womack that is designed to severely limit the interest rate on "payday loans." It hit a major roadblock in the Senate Comm. on Insurance and Commerce. The bill, which had passed the House by an large margin, needed five votes to move it to the full Senate, but it got only one. It can be brought up one more time in the committee. Every payday lending store in Arkansas, about 275, charge more than 17% annual interest the maximum allowed by the state constitution. "An Inconvenient Truth" Displays Al Gore's Inconvent Truth! 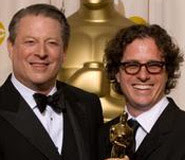 by Bill Smith, ARRA Editorial: Davis Guggenheim won an Oscar for "An Inconvenient Truth." In accepting the Oscar, he said "We did so because we were moved to act by this man (gestures to Al Gore). ... all of us were inspired by his fight for 30 years to tell this Truth to all of us. Thank you, Al. We are so inspired. We share this with you." Al Gore said, "My fellow Americans, people all over the world, we need to solve the climate crisis. It's not a political issue, it's a moral issue. We have everything we need to get started, with the possible exception of the will to act, that's a renewable resource. Let's renew it." So now you have it -- Global Warming has been going on for at least 30 years. Or has it! Well let's flash back to a Time article on June 24, 1974 tilted "Another Ice Age?" A few quotes: "As they review the bizarre and unpredictable weather pattern of the past several years, a growing number of scientists are beginning to suspect that many seemingly contradictory meteorological fluctuations are actually part of a global climatic upheaval. However widely the weather varies from place to place and time to time, when meteorologists take an average of temperatures around the globe they find that the atmosphere has been growing gradually cooler for the past three decades (e.g., 30 years). The trend shows no indication of reversing. Climatological Cassandras are becoming increasingly apprehensive, for the weather aberrations they are studying may be the harbinger of another ice age." "Telltale signs are everywhere —from the unexpected persistence and thickness of pack ice in the waters around Iceland to the southward migration of a warmth-loving creature like the armadillo from the Midwest.Since the 1940s the mean global temperature has dropped about 2.7° F. Although that figure is at best an estimate, it is supported by other convincing data. ... Scientists have found other indications of global cooling. ... Whatever the cause of the cooling trend, its effects could be extremely serious, if not catastrophic. Scientists figure that only a 1% decrease in the amount of sunlight hitting the earth's surface could tip the climatic balance, and cool the planet enough to send it sliding down the road to another ice age within only a few hundred years." So what is the truth? Thirty years ago we faced Global Cooling and a future potential Ice Age. Now, 33 years later we learn that "Al" was worrying 30 years ago that we were going to have Global Warming and now it's here. Let's see, the Earth is how old? Al Gore and other Global Warming worriers are how old? The truth is weather cycles fluctuate! Another truth is that that Astronomers monitoring near-Earth objects expect an asteroid is going near the earth but report that the asteroid 2003 QQ47 hitting Earth in 2014 is one in 909,000. But then who knows, maybe it will hit the earth. Liberal elites say we have Global Warming and they want you to change this by giving up your life style. Are they willing to change their life-style of luxury? No they just buy offsets. I say, let's wait another seven years before worrying about a weather cycle that has swung in 30 years from "we are heading to an Ice Age" to "Global Warming is upon us." If we get hit by the asteroid, it won't matter. If not, which I expect, then maybe we will have more facts on how mankind thinks it is going to change the global weather patters which have been in motion for thousands of years. Oh yes there was an "Inconvenient Truth" displayed at the Oscars -- Al Gore has ballooned - and its not due to warm air! One might recommend his reading another Presidential hopeful's book: Quit Digging Your Grave with a Knife and Fork by Mike Huckabee. Tags: Al Gore, global cooling, global warming To share or post to your site, click on "Post Link". Please mention / link to the ARRA News Service. Thanks! by Dr. Walter E. Williams: Does democracy really deserve the praise it receives? According to Webster's Dictionary, democracy is defined as "government by the people; especially: rule of the majority." What's so great about majority rule? Let's look at majority rule, as a decision-making tool, and ask how many of our choices we would like settled by what a majority likes. Would you want the kind of car that you own to be decided through a democratic process, or would you prefer purchasing any car you please? Ask that same question about decisions such as where you live, what clothes you purchase, what food you eat, what entertainment you enjoy and what wines you drink. I'm sure that if anyone suggested that these choices be subject to a democratic process, you'd deem it tyranny . . .
Chief Justice John Marshall observed, "Between a balanced republic and a democracy, the difference is like that between order and chaos." ... Clearly, we need government, and that means there must be collective decision-making. Alert to the dangers of majority rule, the Constitution's framers inserted several anti-majority rules. In order to amend the Constitution, it requires a two-thirds vote of both Houses, or two-thirds of state legislatures, to propose an amendment, and requires three-fourths of state legislatures for ratification. Election of the president is not done by a majority popular vote but by the Electoral College. In Federalist Paper No. 10, James Madison wrote, "Measures are too often decided, not according to the rules of justice and the rights of the minor party, but by the superior force of an interested and overbearing majority." That's another way of saying that one of the primary dangers of majority rule is that it confers an aura of legitimacy and respectability on acts that would otherwise be deemed tyrannical. 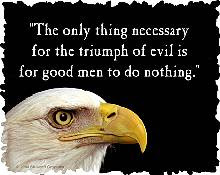 Liberty and democracy are not synonymous and could actually be opposites. [Click for more] Dr. Williams serves on the faculty of George Mason University as John M. Olin Distinguished Professor of Economics and is the author of More Liberty Means Less Government: Our Founders Knew This Well. NRA-ILA Alert: Representative Carolyn McCarthy (D-N.Y.) introduced H.R. 1022, a bill with the stated purpose, “to reauthorize the assault weapons ban, and for other purposes.” McCarthy’s verbiage warrants explanation. Presumably, what she means by “assault weapons ban” is the Clinton Gun Ban of 1994. Congress allowed the ban to expire in 2004 for multiple reasons, including the fact that federal, state and local law enforcement agency studies showed that guns affected by the ban had been used in only a small percentage of crime, before and after the ban was imposed. Tags: AFRW, Arkansas, Arkansas Federation of Republican Women, Arkansas Republican Party To share or post to your site, click on "Post Link". Please mention / link to the ARRA News Service. Thanks! In case you missed it with all the activities last year, The Reason Foundation released a report challenging a Rand Corporation study that claims universal preschool will deliver $2.62 in benefits for every dollar spent by California taxpayers. 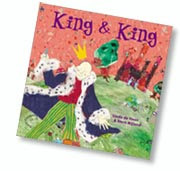 The Rand report has been thoroughly discredited by two San Jose State University economics professors who show the Rand preschool study "cherry-picked" data, based its claims on "unbelievable assumptions that bias the results," and omitted numerous costs and other factors that significantly lower the alleged benefits of universal preschool. Tags: preschool benefits, Rand Corporation, Reason Foundation, universal preschool To share or post to your site, click on "Post Link". Please mention / link to the ARRA News Service. Thanks! To The American People -- These Colors Don’t Run! I know the American People want change in Iraq, our military wants change and so do their families. The change we want is for everyone to stop undermining the war effort and support our troops so that they may achieve a complete military victory in Iraq and Afghanistan alike. Please, as a Mother of a Marine serving his third tour of duty, on his behalf, on the behalf of his brothers serving along side him, our troops, and their families, lay down your anger towards one another and do what is right and in the best interests of our Military. PSA - "THESE COLORS DON'T RUN"
Click to see your congressman's record on illegal immigration. by Jane Williams, AR Animal Producer's Assoc: The ARAPA is a group of ranchers, farmers and concerned individuals working against the National Animal Identification System (NAIS) in our effort to hold onto the Constitutional freedoms and rights to private property (our animals) and to protect the lifestyles of traditional farming and animal owners. The right to continue to rear and market plants and animals in the traditional manner that has served us so well for hundreds of years hinges on passage of The Freedom to Farm Act HB1761 which was filed by Roy Ragland (R). It has been referred to the House Committee on Agriculture, Forestry, and Economic Development. The ARAPA stresses that even if you do not own animals or plant a garden, you please support this bill so that those of us who do produce food can continue to do so without excessive costs and regulations that will put many of us out of business. The bill is anticipated to be before the committee on March 14th. Tags: farming, Arkansas, Freedom to Farm Act, NAIS, National Animal Identification System To share or post to your site, click on "Post Link". Please mention / link to the ARRA News Service. Thanks! by Bill Smith ARRA Editorial: A New Your Times article titled "Christian Right Labors to Find ’08 Candidate" by David D. Kirkpatrick also appeared in Sunday's Arkansas Democrat-Gazette and other papers across the nation. Kirkpatrick displays a blatant use of hot-button words, like "Christian Right" and "secretive club” in an effort to gain readers' interest; and it probably worked. He begins by stating that the Christian Right as being led by a secretive club known as the Council for National Policy and is headed by leading Christians like James C. Dobson of Focus on the Family, the Rev. Jerry Falwell of Liberty University, Grover Norquist of Americans for Tax Reform and Paul Weyrich of the Free Congress Foundation. Amazingly the meeting was so secret that Kirpatrick and other left-wing reporters knew about the meeting, made their way to Amelia Island but were saddly "left out in the cold" while veryone else enjoyed the warm weather. Kirkpatrick says that "The Council for National Policy was founded 25 years ago by the Rev. Tim LaHaye as a forum for conservative Christians to strategize about turning the country to the right. Its secrecy was intended to insulate the group from what its members considered the liberal bias of the news media. In recent years the group has brought together a cross-section of the right from Edwin J. Feulner to Wayne LaPierre of the National Rifle Association." "The council’s bylaws forbid members from publicly disclosing its membership or activities, and participants agreed to discuss the Amelia Island meeting only on the condition of anonymity." However after detailing the secrecy of the group, Kirkpatrick goes on reveal the alleged secretly expressed positions by Christian Right leaders about several GOP candidates He goes on to cite direct comments by Paul Weyrich, Gary Bauer, Mike Huckabee, and numerous unnamed sources. Even with Kirkpatrick left-wing biased approach, any reader with any sense of reason will see that it is no big secret that the Christian Conservatives have not settled on whom they believe will be the front runner for the GOP or suitable to the majority of "Christian Right." It is also no big secret that the Christian Right does not trust the left-wing press! From the Left we may hear "Lord Forbid - are these people meeting!" But from the Right we will probably will hear, Thank God -- these people are meeting." And to Kirkpatrick and the New York Times, thank you for again revealing your left-wing bias so clearly to all readers.